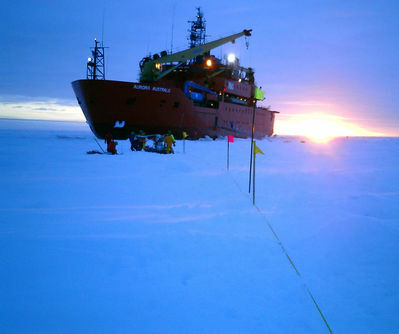 The ARISE research teams often worked through the day and into the night, by the aid of the icebreaker's flood lamps. Until the last 40 years, the only way to study sea ice was to actually travel onto the ice and take in situ, or ground-based, measurements. Travel on the ice was a costly, time-consuming, and dangerous pursuit, and scientists could not stay on the ice very long. Thus, records of sea ice before the 1960s are very sparse. Some of the best early records of sea ice extent—those from the late 1800s—came from whaling ships. However, these reports were not necessarily reliable because whalers had more interest in protecting their hunting grounds than being forthright with information. Russia has one of the best in situ records of sea ice, obtained from several ice camps set up in the Russian region of the Arctic. These records date back as far as 1928, but they are continuous only from 1954 to 1993. With the collapse of the Soviet Union, funding for the camps was discontinued, but they have since been restarted and camps have been operational since April 2003. NSIDC provides some of the ice camp data, called the Morphometric Characteristics of Ice and Snow in the Arctic Basin: Aircraft Landing Observations from the Former Soviet Union, 1928-1989. The U.S. research on the sea ice is much less extensive than that of the Russians. However, the U.S. did have several ice camps from the 1950s through the 1970s, most notably on Fletcher's Ice Island T-3, a large mass of grounded ice that drifted around the Arctic Ocean until it flowed out of the region in 1984. Icebreakers have frequently cruised in the Arctic and Antarctic to research sea ice, the ocean, and the atmosphere. However, due to cost and logistics, longer-term field camps have been relatively rare. One prominent field experiment was the 1975-1976 Arctic Ice Dynamics Experiment (AIDJEX), which included four manned camps. Another was the Coordinated Eastern Arctic Experiment (CEAREX) in 1988-1989, which employed moored icebreakers as a base for the camp. NSIDC provides data from CEAREX. The most recent, and by far the largest and most complex field experiment devoted to sea ice, was the Surface Heat Budget of the Arctic Ocean (SHEBA) project (visit the SHEBA Web site). A Canadian icebreaker was purposely frozen in the Beaufort Sea, north of Alaska, from October 1997 to October 1998. The U.S. National Science Foundation funded the project, which involved 35 scientists and dozens of support personnel. These scientists studied changes in sea ice, ocean, atmosphere, and biology over a full arctic year. While satellite imagery and models can provide data that are more comprehensive in time and geographic area, in situ data are still valuable. Field camps, drifting buoys, and automated weather stations produce data at scales that are too small for a satellite or model to observe. These small-scale observations are essential for validating, or verifying, the accuracy of satellite and model products.